Today whee wanted to show you all our playpen! 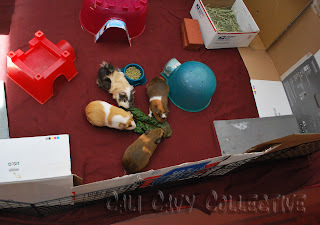 This is our play area outside of our regular cage. It's a 5 by 7 foot enclosure, with several protective layers of fleece and towels over a rug. 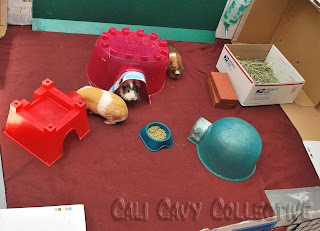 Our humans fenced it off using some of the grids left over from our C&C cage, and put cardboard around the perimeter because certain piggies like to spray pee really far outside. Although whee secretly think Belka does so as revenge against the humans for creating such an escape proof enclosure. 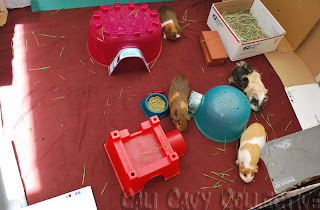 In our playpen, whee always have a water bottle, a bowl of pellets, pigloos, a cardboard box filled with hay, and several bricks to use as stepping blocks. 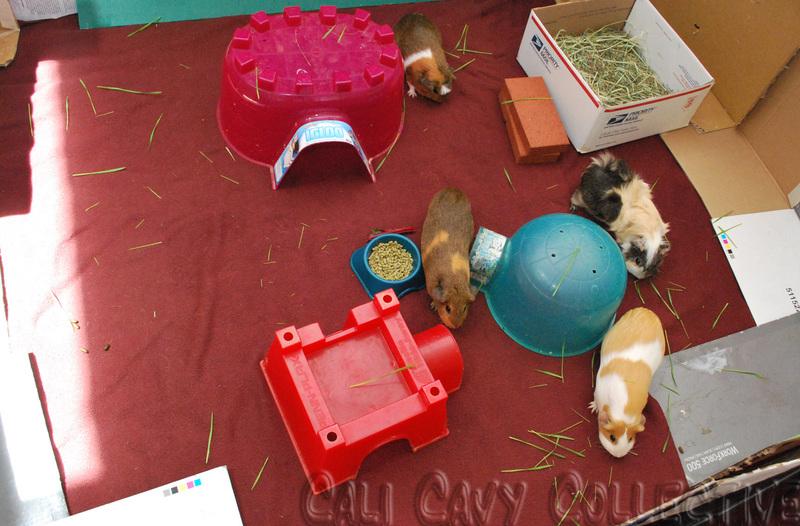 There is always a box or two lying around, so our slaves fill them with hay for us to jump into and munch on. We are rather fond of going to the bathroom while eating in there, so when it gets soiled they just compost it for us and give us a new one. Sometimes whee also get paper bags, cardboard tubes, or tunnels to play in. 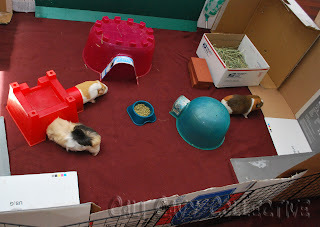 Whee usually get to stretch our legs in our playpen every day or two for several hours. Our slaves say that this way, we keep active and healthy by promoting more exploration and exercise (whenever whee visit our vets, they always comment on how surprisingly muscular and fit whee are). 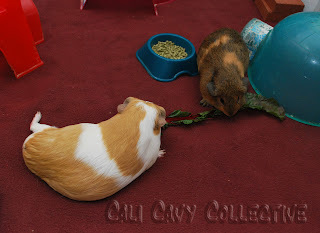 Often we also have meals delivered here, such as in the pigture below where we're all sharing a leaf of Swiss chard. Our favorite is when the slaves scatter wheatgrass everywhere, it challenges all of us to run around as rapidly as possible with the goal of eating more than anyone else can!